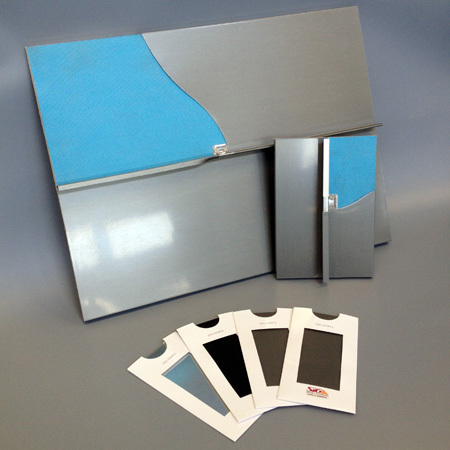 Sample packs of NedZink’s Naturel, Nova and Noir zinc finishes are now available to specifiers and contractors from SIG Zinc & Copper. Sample packs of NedZink’s Naturel, Nova and Noir zinc finishes are now available to specifiers and contractors from SIG Zinc & Copper. The packs are designed to highlight top quality ranges made to EN 988 that are exclusive to the SIG national supply chain. They are suitable for roofing and facade applications, gutters, rainwater and drainage elements. We also have a range of samples of Rainbow Pigmented Pre-Weathered Zinc Sheet by elZinc in Blue, Green Red, Brown and Gold. Please fill in the form below to request a pack of samples. Please note, samples are not available for small projects (e.g. Under 40m2). If you have a smaller project please contact us using our standard contact form for more information.